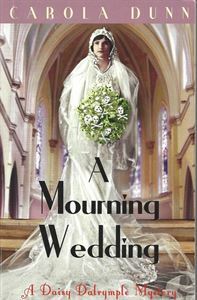 The inimitable Daisy Dalrymple Fletcher and her husband Detective Chief Inspector Alec Fletcher seem to get a reprieve from their sleuthing duties when they are invited to the wedding of their friend, Lucy Fotheringay. Lucy's grandfather is hosting the ceremony at his beautiful estate and so it promises to be a typical affair with hordes of gossipy aunts and other colourful, but not necessarily pleasant relatives. Daisy meets all these characters and observes the ensuing familial fraternization with a certain kind of amusing nonchalance. That is, until Lucy's great aunt is found strangled to death in her bed. Lucy, in the meantime, has arranged to meet her betrothed in the conservatory, but when she arrives she finds him trying to revive her uncle, who has died-or has he been murdered? And just like that a normally celebratory occasion turns suspicious. Now Daisy must sift through a throng of relatives-aunts, uncles, cousins, grandparents - once wedding guests and now murder suspects. And she must find the killer quickly before another family member becomes a corpse.